I’m arrived in Playa del Carmen on Monday night and has been pretty fun. I’m loving this amazing trip a lot, and let me guys say that Job Trippin is definitely not a liar. On their own website you could exactely read the quote “This is the journey that will change your life” and yes, believe me – I’m feeling it a lot and I’m just waiting to know how things will go so far till the end of this super trip, to discuss about it with you too. So, I’m so ready to let a new week begin in a new place, but I’m also so ready to give you some advices about what to visit while in Mexico City, now. The city – as I’ve already told you in my latest article here on the Blog – is really BIG. Like, BIG BIG BIG – so it’s quite difficult to leave it thinking that you discovered every corner very well. But, at least, there are some places you must give a visit to, while there. So, here’s my top list – My must-visit places in Mexico City that I’d discovered few days ago with Job Trippin! Zócalo is the main square of Mexico City and it’s also called La Plaza de la Constitución. During the Aztecs era, this historic place had a different name: Tenochtitlan’ – it was the most important ceremonial center of the country and that’s why even right now it’s so important in the city. Plus, do you know what? In Mexico, they actually use the word zócalo for the most important square of every city. So, the guide from Mexico a pie, the walking tour we’ve took while discovering the historic city center in Mexico City – told me that if you are everywhere around in Mexico and you need infos about how to arrive in the really downtown in any whatever Mexican city, you could just ask for the zócalo and everyone will understand you very well! Nice, right? 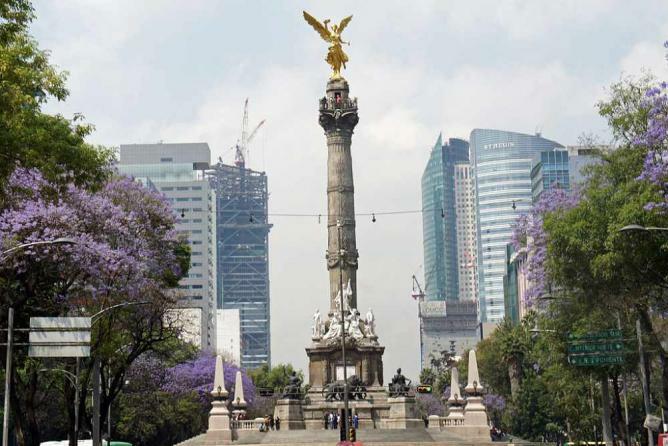 Paseo de la Reforma has been designed in the 1860s and is modelled after the great European avenues and boulevards, most of all the ones in Paris, France. As I’ve already told you, I’ve been staying in a really fancy quarter of the city in Mexico City – Polanco. Well, Paseo de la Reforma is not pretty close to Polanco, but still really fancy as well! It’s the perfect container of many of the capital’s talles buildings and this is just the reason numer 1 of many because I’ve loved it so much. I felt in New York while walking there! It was really sunny, not too warm – everything were just perfect. The tallest building there, it is Torre Mayor and one of the most famous statues there is the Angel of Independence, really huge as you could see from this picture below shoted by Mariordo. Also known as the Chapultepec Park, this is the biggest beautiful park I’ve ever seen. We visited it on our first day in Mexico City – we were really tired from the super long flights, definetely jet-lagged too – but it’s been so cool to chill and relax taking a walk out there! The Bosque de Chapultepec is famous for being one of the largest city parks in the Western Hemisphere with 686 hectares and more than 1695 acres – I can’t even imagine it! Flowers everywhere, little local markets selling sweets and snacks, children and family enjoying the sun at every corner. A magic place you must visit at least once, and I’m pretty sure you’re going to love it the way I do. 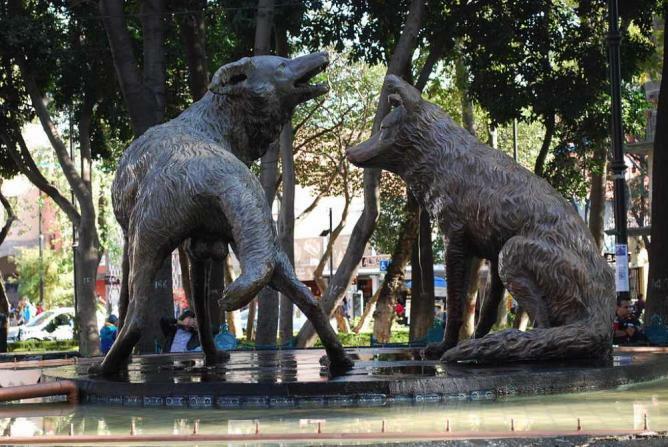 Another really cool quarter in the city, it’s Coyoacán – cheaper than Polanco but fancy as well. Safe for tourists and cool during the night! It’s probably one of the most exciting ways to discover Mexico City since it’s such a colorful area with music at every corner, dancers in the streets and cafés or cantines with amazing local food served [no worries, I’m going to write about Mexican food too, pretty soon]. In Coyoacán you can smell… Folklore, and I’ve honestly liked it so much – plus lots of Mexican culture. I’ve “accidently” spotted the Museo Soumaya the first night I was in Mexico City. With my Job Trippin’ crew we simply decided to go to the nearest mall close to home, and we endend up in front of this amazing modern building down here. Stunning, so beautiful, really Instagrammable -The Museo Soumaya, designed by the Mexican architect Fernando Romero, is a private museum in Mexico City and also a really famous non-profit cultural institution with couple of museum in the city, in Plaza Carso and Plaza Loreto to be more specific. Slim, who died last 1999. In 2013, the museu, han also been the 56th most visited with an attendance of who died in 1,095,000 visitors. As you can may imagine, I shooted this pic before my really first sunset in Mexico City. So cool, right? The location of this great museum in Nuevo Polanco, litteraly “New Polanco” – and as I’ve already told you, we were staying exactely there with our amazing AirBnB. Do you remember “Mexico a pie” – the walking tour my Job Trippin’ #NomadFamily and I we took when we visited all the historical center of Mexico City? Well, in the same date we also got a visit to Palacio des Bellas Artes – a really huge building I immediately loved so much! Look at this, isn’t it cool? I know, there are so many places more you should visit while in Mexico City and these up are definitely not enough… But, I want to be honest – so, these are my favorite from the ones visited in just few days. And what about you? Have you ever been to Mexico City? What do you think about it?